Do you remember that show? If you're around my age, which is a very young and spry forty-two, then you know Mutual of Omaha's Wild Kingdom. I loved that show. Way before the Discovery Channel started doing documentaries on sharks and alaskan crab killers and whatnot, Wild Kingdom would take us to the natural habitats of all types of beasties and creepy-crawlies and stuff. They started in 1963 and apparently they are still kickin'. I think they just do videos now. Anyway, I have always lived in a Wild Kingdom of sorts from the minute I moved out of my parent's houses. It's still going strong! We've narrowed it down a good bit, but I've still got my critters. This summer (we did have summer at some point, right?) I focused on doing a lot of nature stuff with Allie here at home. 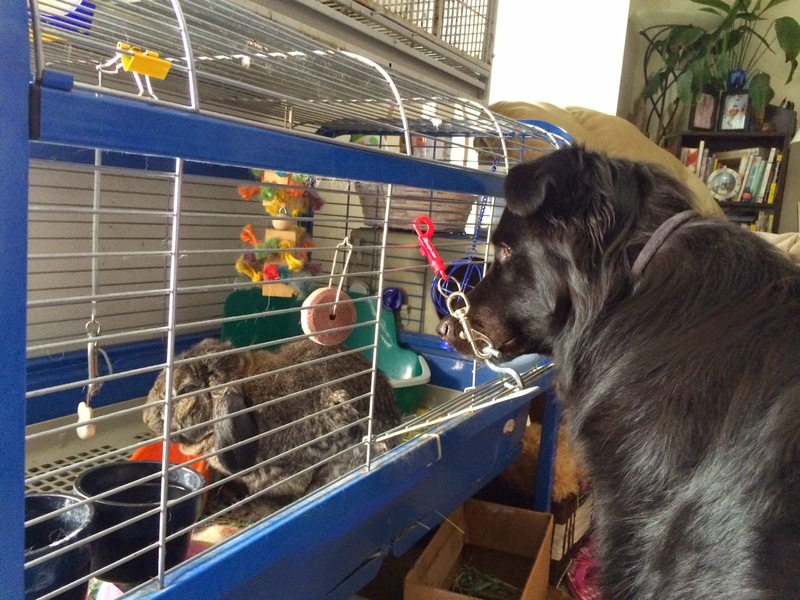 So, I present to you, Our Very Own Wild Kingdom In Pictures. Enjoy. 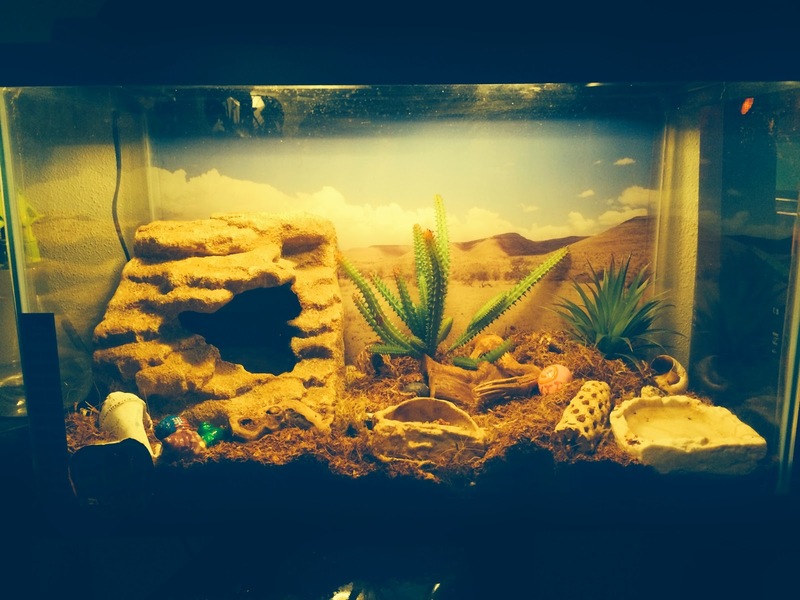 Welcome to The Crabitat That Screwed Me. I'd love to introduce you to all five of the sonsabitches, but I made the huge error of following the directions on "how to keep hermit crabs" from a website for people who seriously love their crabs . I've got everything in there from the regular water to the salt water bath to three kinds of food to quality substrate. They used to get moss, but I'm pissed at them, so they're moss-deprived now. Why am I ticked off? Because they did what happy crabs do and they buried themselves! You may ask, "Are you sure they're alive?" I can confidently confirm that they are indeed alive. I know this because Allie and I make Justin dig them up for Proof Of Life checks every other week. What a joy it is to take care of invisible pets! I should've bought a pet rock. Meanwhile, back on the ranch, we started a vegetable garden from seeds in May. 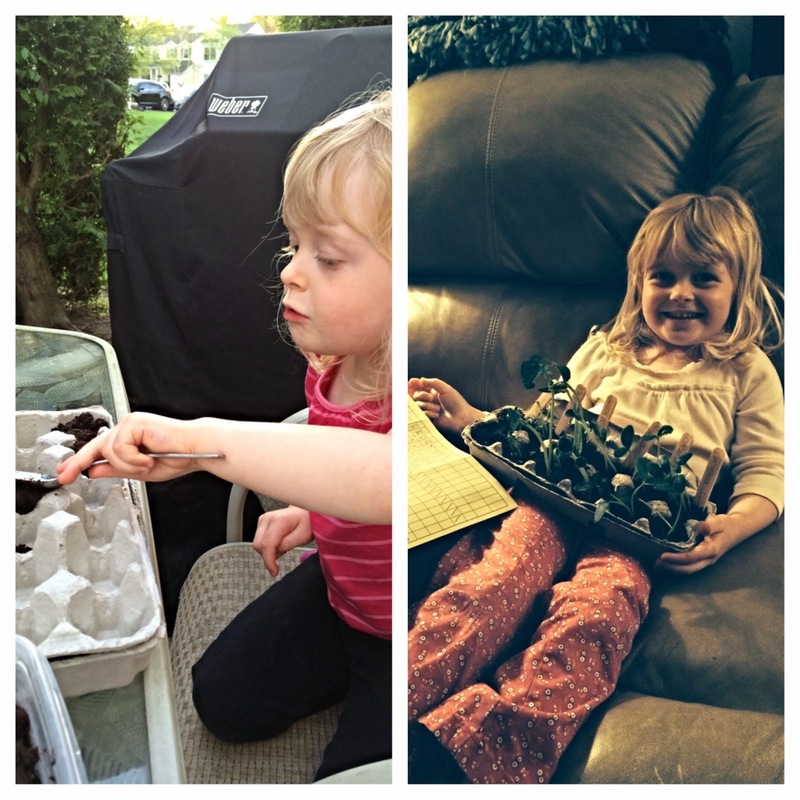 My mother-in-law found this cute little do-it-yourself grow kit for Allie and I to do together and this is our second year attempting it. Allie planted every seed herself. You know how kids are with this kind of stuff, right? They plant a seed and suddenly decide they didn't like the placement or weren't sure it went in the hole, so they dig it back up. Therefore, the actual planting process became quite extensive. 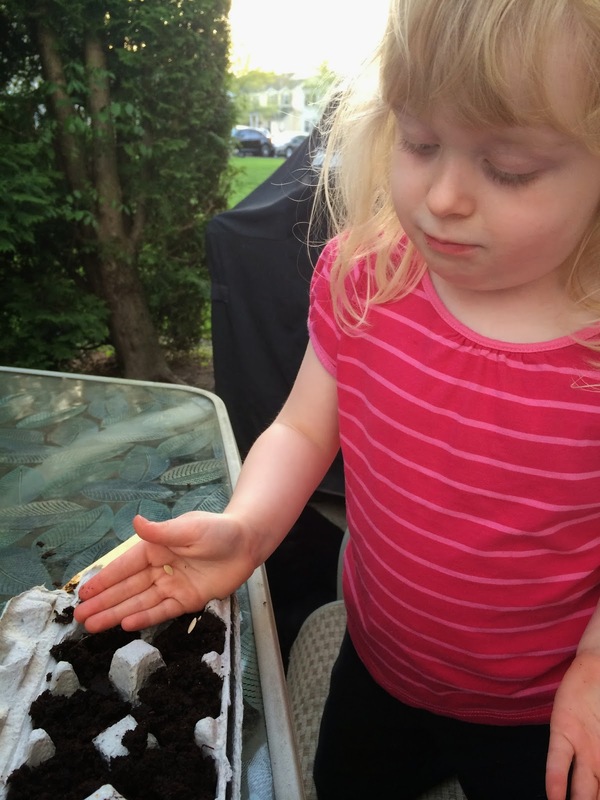 Every day we watched the little cups of dirt for seedlings to sprout, and then watered and measured them. Thirteen days later we had a situation. Our sprouts were seriously sprouting. I wouldn't even call them seedlings because they were outgrowing their carton waaaaaay before the directions said they would. Allie was super excited about this and we immediately embarked on a search for a system to help us grow vegetables on a cement patio. I was happy to discover that I'm not the only nut who tried to do this. Container gardening is really popular now. 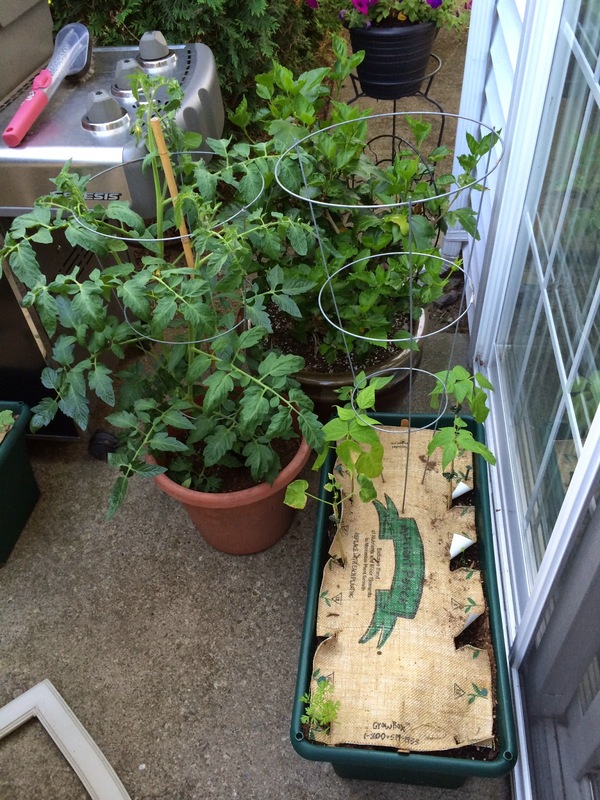 I think the tomato plant was intimidating the beans and carrots. I had to separate them. For my birthday, I asked Justin to get me three of these awesome self-watering grow boxes. I was seriously excited about them. Allie kept wanting to pick up the burlap top "just to check", which is entirely against the rules according to the grow box people. (She couldn't tell me what she was checking for, so I decided to be a law abiding gardener and deny her wish to peek.) Justin, Allie and I transplanted our cucumber, squash, green bean, carrot and watermelon plants and those little buggers were off to the races! They grew like..... I guess like vegetables grow. Fast and stuff. Flash forward two months and I've got a jungle on my patio. It's insane! And there's all sorts of drama. The plants drink way faster than the self-waterer can keep up with, some kind of dusty mold stuff is attacking my cucumber plants and I have to keep cutting them back, and it's seriously over-crowded on my deck which makes enjoying our lovely patio furniture difficult. 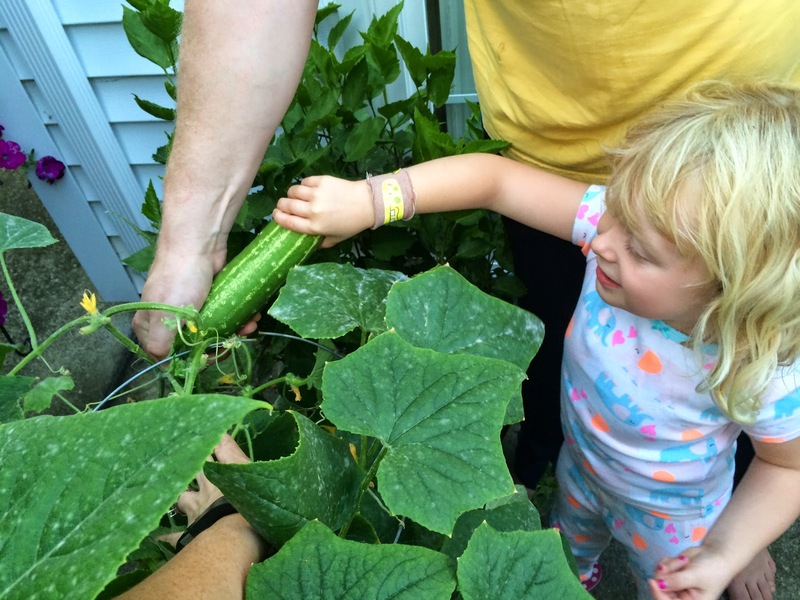 But it was all worth it to watch Allie pick the veggies! She was dying to do it for weeks! 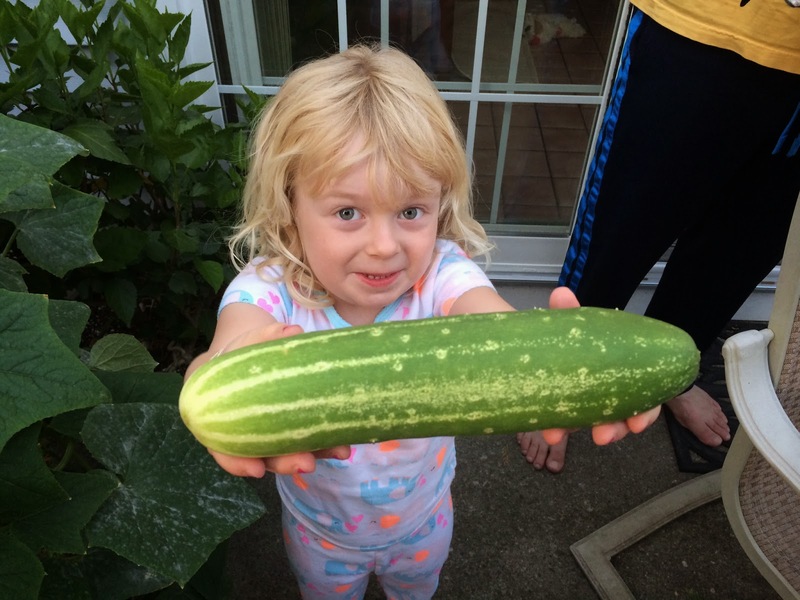 We got some green beans, but the big score was the cucumber. If you ever have a chance to taste garden cucumbers, you will understand why I loooooooove them so. They make the ones at the grocery store seem plastic. Justin and I ate this cucumber and actually fully evaluated its fabulousness as if we were professional cucumbers connoisseurs. Unfortunately, Allie doesn't like any of the vegetables we are growing, other than maybe the carrots. She prefers broccoli and cauliflower. I know.... don't be hatin'! My kid likes the vegetables most kids hate. She asked for broccoli plants next year. I really can't imagine growing broccoli on my porch, so that negotiation is off the table. This is the first bouquet Allie ever made for me. 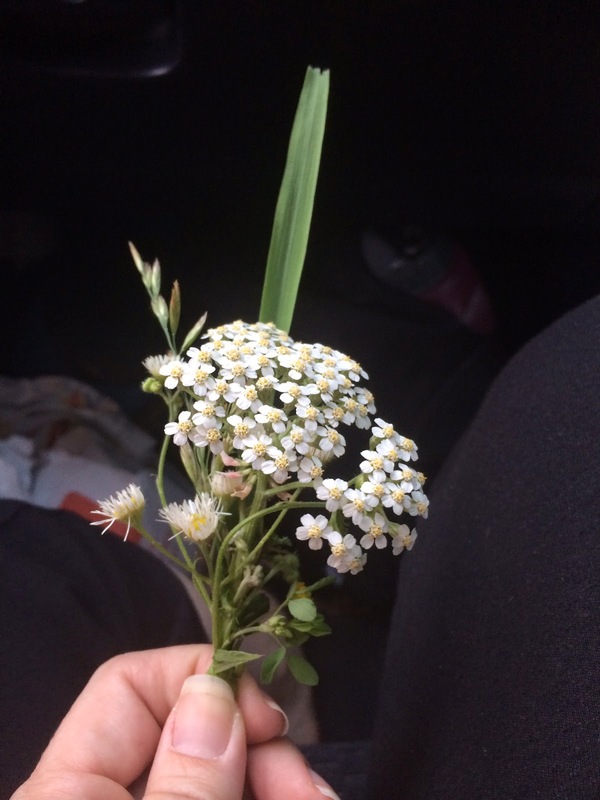 She picked them on the side of the road in New Jersey somewhere when we made a stop on our way home from Virginia in June. My sister got one too. It was so cute that I had to take a photo. I'm digging the floral arrangement....and the one blade of grass. New York bear. He was very gangster. 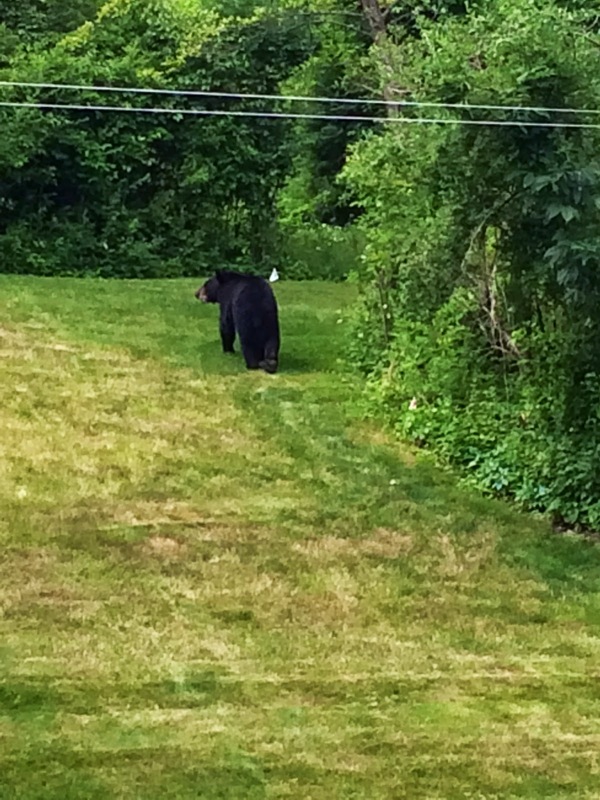 Since we're talking about wild animals.......this is a bear that happened to come out of the woods at a customer's house one day. He just sauntered out and up the hill. We've had some bear sightings in our condo complex this month so Allie is on red alert with Bear Watch 2014. When people tell stories about how the bears were on their back porches or walking across the road, Allie starts freaking. To be honest, I don't blame her, because when this bad boy in the photo above came strolling along, I didn't breathe, blink or swallow until he left. Very scary. I'm not sure if I mentioned this before, but my kid has a second personality named TuTu. Out of nowhere she decides she is TuTu the dog and if we try to address her as if she were human, she gets annoyed and corrects us. "NO! I'm NOT Allie! I'm TUTU!" How bad could that be? Well, when she wants to have a leash put on her to go outside, or tries to pull her pants down to poop in the front yard like our dog does, that's a problem. I'm thinking there's a firm "No Pooping On The Ground If You're Human" policy here at our complex. Anywho, I did some dog boarding this summer. It's been about 4 years since we boarded and we gave it another shot. The dog in the photo is Molly. Molly is quite cooperative when playing the TuTu game, which is nice. We adore and worship Molly. We want to keep her, but her humans are not super keen on that idea. 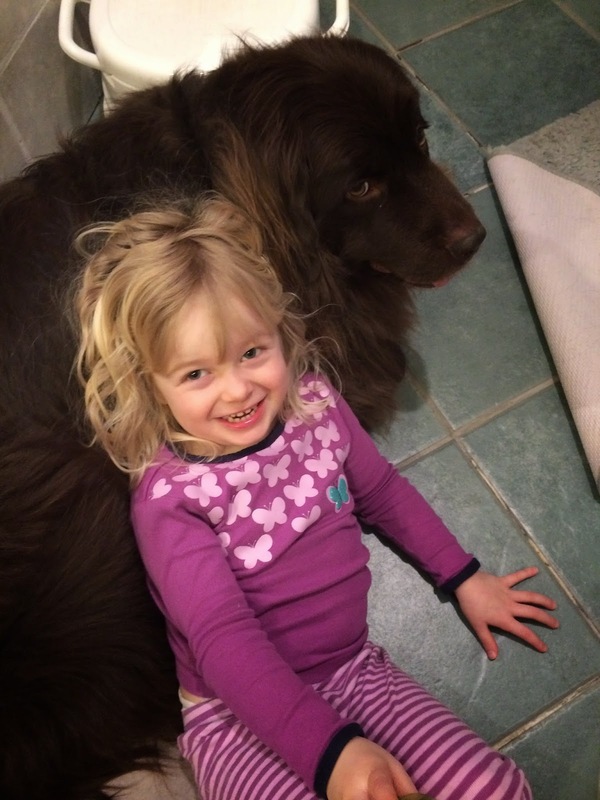 In case you were wondering where the name came from, she chose it when this Newfoundland stayed with us. Lulu is a precious gem. Just amazing. And gianormous. Completely hugeantic. 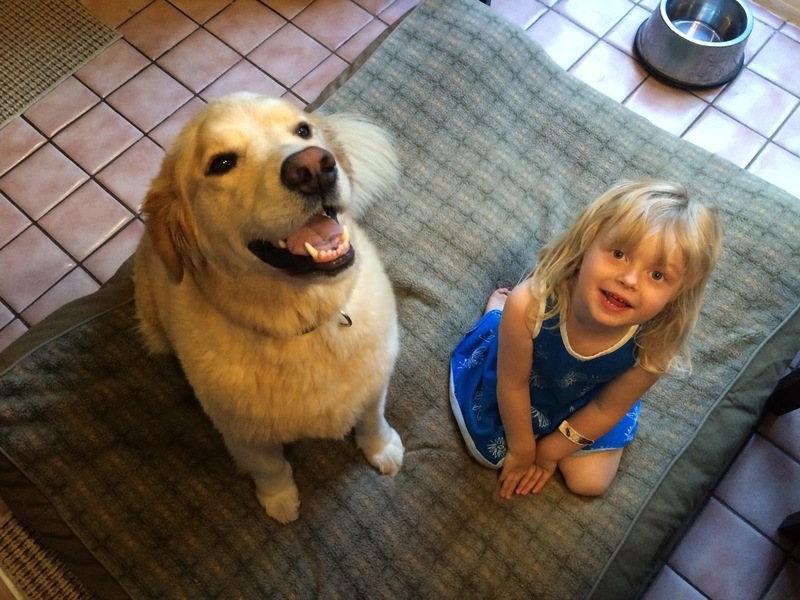 But she's really good with Allie and they are very good buddies. Lulu and Tutu are a team. A force to be reckoned with. I nearly stepped on them when I got out of the shower one day. They were snuggled up on the floor right below me. If they were plotting to take me down, it was an excellent plan. Shut up. 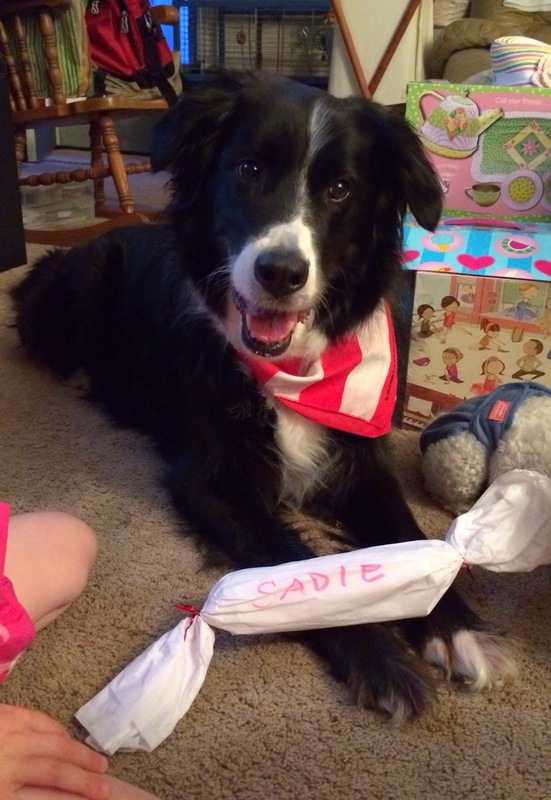 I know I said it was the last animal picture, but I thought I should post a photo in case you were wondering who Sadie was. I'm just doing it for YOU. It has nothing to do with how I love her as if I gave birth to her. Nope. Nothing like that. 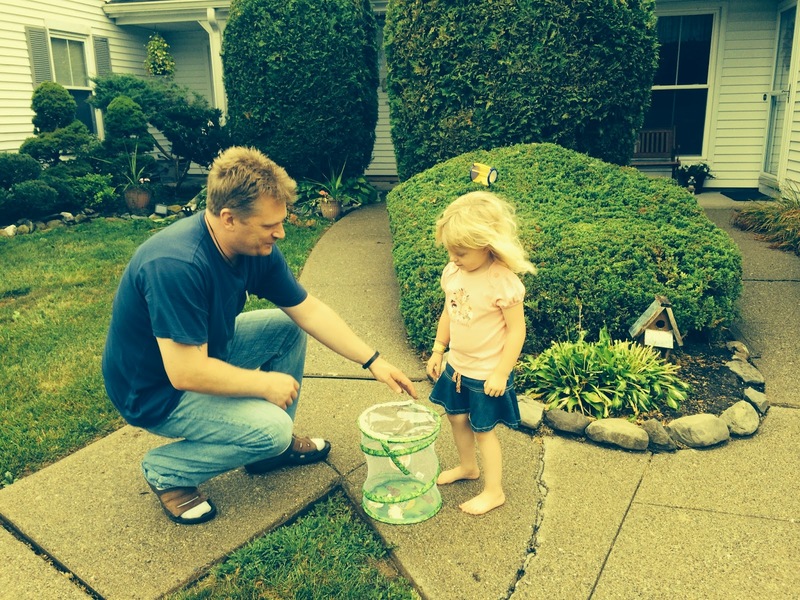 Justin and Allie went to run and errand and came back with a Butterfly Garden thingy. Oh joy. Another thing for me to be in charge of. But I thought it would be educational for her to see the process of a caterpillar becoming a butterfly, and she certainly deserved it after the Crab Family became such snobs. The 'Pillars came in the mail, spent three days growing and then decided they were ready to make a life change. Suddenly I found them in the middle of the packing process. That's some serious luggage! Allie wanted to know if they each had "a potty in there". She was very concerned about how they would "pee and poop" while changing in to a butterfly. Hey! Can you turn off the light?? We're sleeping here! 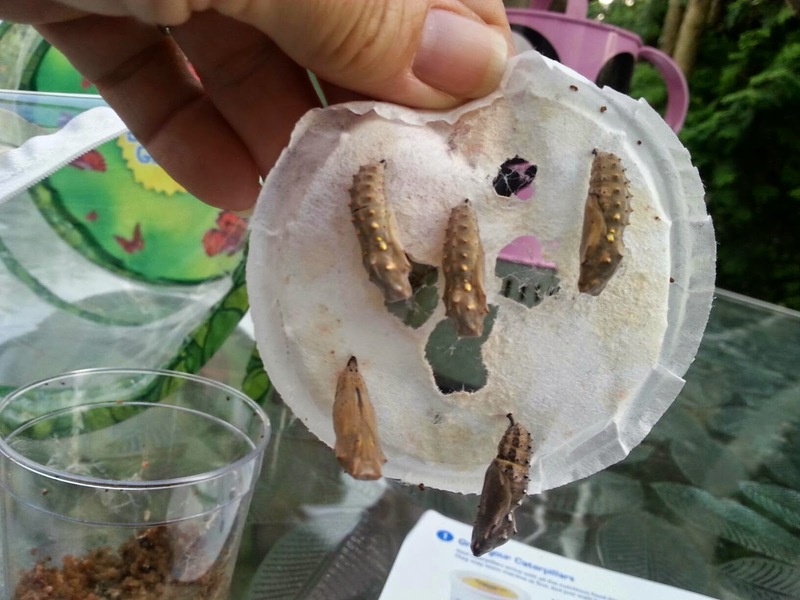 They became five lovely chrysalises. Not cocoons. Because my mom, the science teacher, corrected me every time I said cocoon. "They are NOT cocoons. 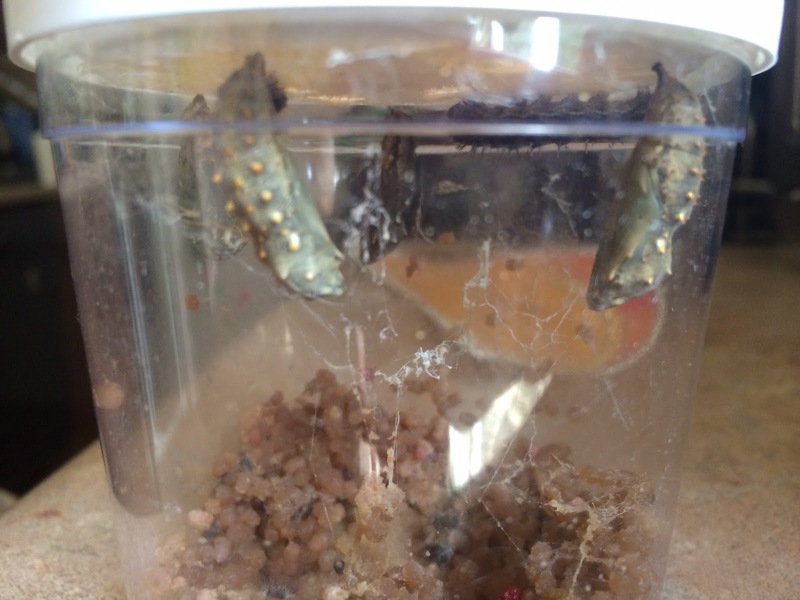 They are CHRYSALISES." Personally, I think she just liked saying it. Chrysalis. Chrysalis. I believe this because I kind of liked saying it once I was forced to go cold turkey with my 'cocoon' usage. Who drew that DREADFUL portrait on the floor?! I'm far more spectacular than that! I knew when they "hatched" because I got the call one morning and Allie was screaming "THEY'RE HERE! THEY'RE HERE!" on the other end. It was a lot of fun watching them and Allie wanted to observe them constantly. The most difficult part of the entire process was getting her to understand that "you don't shake, drop or take the lid off of the container." And of course, THOSE are the first three things that every three year old wants to do with a tightly closed container. Today was the day that we decided to let them go free. 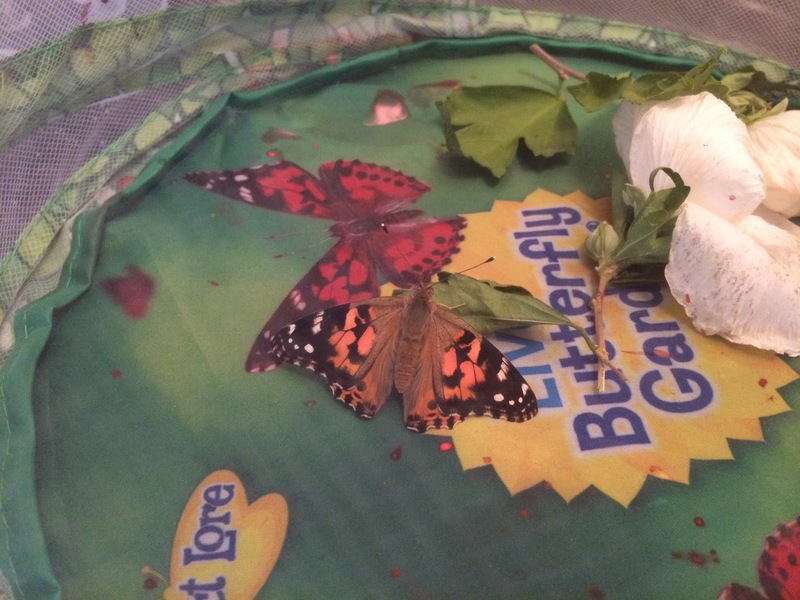 Butterflies only live 2-4 weeks so they were wasting far too much time watching tv in my house! It would be like me watching 15 consecutive years of television. Did you get those last words, "Are they all out?" "No." This scenario annoys me because if you've ever been to my home, you would never guess that I have a cat. Nay nay! No cat! That's because Lucky, the cat, is anti-social to an extreme. She doesn't even like to be social with me and I FEED the little beyotch. She religiously gives me death stares at night. It really pisses me off when I'm watching tv and I feel like a hole is being burned thru my head because she's staring at me, thinking profanity and wishing bad things would happen to me. 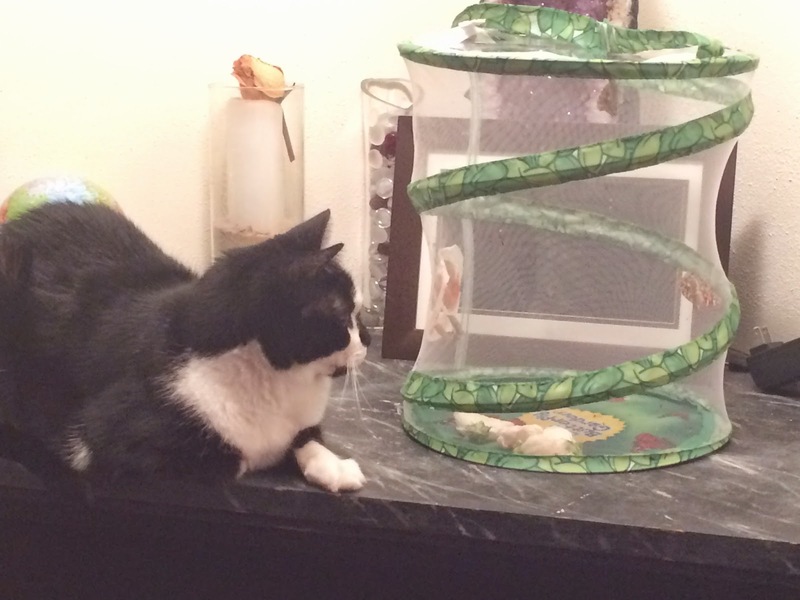 So, now that we have butterflies, she decides that she wants to become part of the family and participate in activities..... as long as they occur within a 5 foot radius of the butterflies. When these last two leave the establishment, I'm sure she'll go back to looking at me like I'm evil as she runs away. Well, that's it. It's been an interesting summer thus far. Crabs, chrysalises and cucumbers. Very eventful indeed! The perfect finale would be winning a new car. Another C on the list. I guess I should start entering in car giveaways if I'm looking for that to happen, huh?